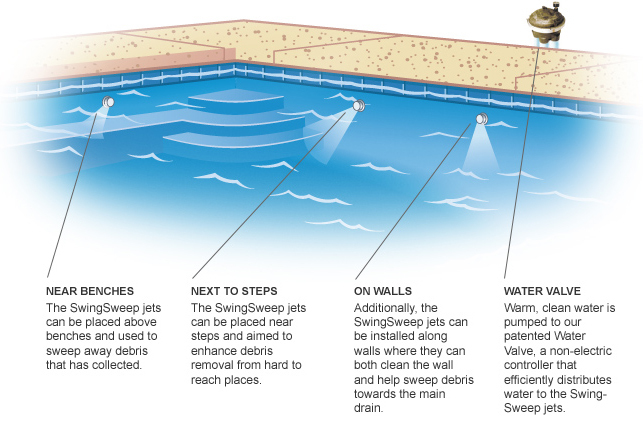 Paramount Pool and Spa Systems, the world’s leader in In-Floor Pool Cleaning Systems, continues its commitment to pool cleaning and enhanced water circulation with SwingSweep. SwingSweep’s patented wall mounted jets, powered by our Swingjet technology, fit into most threaded wall returns and deliver an infinitely adjustable 3-step 90 degree water flow arc with an innovative automatic reversing mechanism. SwingSweep is ideal as a stand alone system, improving both cleaning and circulation, and can even supercharge any Paramount In-floor Cleaning system. Hydraulically-engineered SwingSweep Jets are placed as wall returns. When activated, the jets pop out to deliver a high-pressure stream of water. When not operating, the jets retract and then rotate to a new position upon the next activation. The SwingSweep jets can be aimed to focus the 90 degree cleaning arc to target steps, benches and hard to reach places. SwingSweep offers you the ability to take any Paramount cleaning system to the next level of cleaning and circulation with the addition of swingjet technology. SwingSweep is only available through Paramount Authorized Builders. To find a builder or service company near you, please click the Find A Builder link on the top right of this page. If you are a pool builder and would like more information, please notify your Paramount Regional Sales Representative or contact Customer Service via phone at 1.800.621.5886 or e-mail paramount@1paramount.com.